Ideally located in the heart of Cannes, this beautiful loft is fully renovated and meticulously decorated. It benefits of a enjoyable sunny terrace. A bathroom with separated toilet, air-conditioning, a modern and fully equipped kitchen. The upstairs bedrooms got his own toilet and sink. In a 100m perimeter you will find : Supermarket, pharmacies, bakeries, and a multitude of different shops. This seaside resort is the meeting point of the French Riviera and the place of establishment of the very famous Film Festival. You will be 5 minutes walk away from the Palais des Festivals and the well known red carpet stairs. Very nice apartment, spacious, clean, easy acces & very good bed! Great help from our host, we look forward to renting again with Fair Place for our next stay!!! 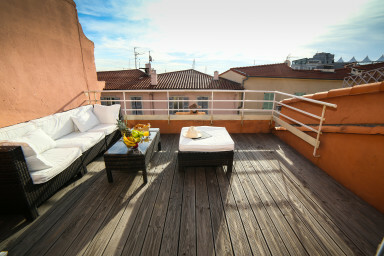 This spacious, sunny loft was perfect for our stay in Cannes! With two floors, two queen beds, two bathrooms – it was really a great set up for two colleagues to share during Cannes Lions. The apartment was very modern and clean and equipped with everything you need to have an easy stay. One of our favorite parts of the apt was the balcony which is perfect for wine and watching the sun set! The apt is also in an extremely convenient location - very close to all of the major hotels, stores, yachts and restaurants. Lastly, the team at Fair Place was absolutely phenomenal. From pre-trip planning, during our stay (including welcome treats!) and to closing out – everything was seamless. I would recommend that anyone stay here and I can’t wait to return. Appartement tres bien situe et agreable .Beaucoup de charme Tres agreable terrasse. Prestations tres correctes: literie, salle d eau, linge....L appartement se situe au 3 e etage de l'immeuble mais cela n est pas derangeant. plusieures remarques:seul le sejour est climatise,( la puissance de la climatisation sous evaluee par rapport a la surface de l appartement) il en fesulte que les chambres a coucher sont donc juste ventilees et sous les combles il regnait une chaleur etouffante,,impossible d aerer pour faire un courant d air: on a ete litteralement envahi par les moustiques.! le frigidaire est un peu trop petit pour 4 personnes et ne dispose pas de glaciere, il manque un grand microondes ainsi que des plats a passer au four. le reseau internet est aleatoire avec de nombreuses coupures;. Malgre ces quelques remarques, nous avons passe un tres agreable sejour. A recommander.